The first community youth work students to receive training in entrepreneurship at the University of Ulster received certificates at the Magee campus today. Speakers at the awards ceremony emphasised the importance of the skill for those who will be in community and youth leadership roles, and in helping marginalised young people cope in the current economic climate. The event highlighted the role of the University and Magee in supporting development of community and youth work across the North West. Students who are already working in the sector undertake certificate and diploma courses leading to BSc Honours Community Youth Work, which qualifies them as professional practitioners and enables them to progress in their careers. Magee offers a certificate in entrepreneurship with the degree, an award which is believed to be rare in university provision. Thirteen students received certificates from Mr John McCormick, Director of Youth Work Services with Youth Council for Northern Ireland, who is an Associate Professor at the University of Ulster. Mr McCormick said: “In this era of economic uncertainty which places young people particularly at risk, it is important that youth workers have training in entrepreneurship. The students and guests were welcomed to the campus by Professor Tom Fraser, the former Provost of the Magee. 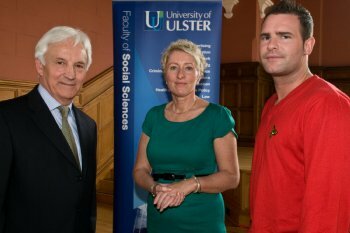 The study programme was launched at Magee in 2002 following demand for local training by the sector in the North West. Until then, all prospective students had to apply to the Jordanstown campus, where the course continues to flourish. Breda Friel, course director and lecturer, said: “It is a four year part-time course and the students are drawn from all over the region. We have students who come one day a week from as far away as Carrickfin and Gweedore in west Donegal and Bangor and Belfast, as well as students from Derry and closer to home here. “The course is a success because of the collaborative nature of its delivery with our partners in the community. We work very closely with partner organisations and groups who are very good about supporting their employees to have professional development training and secure the professional qualification. The 13 students had to describe how they had applied entrepreneurship theory, practice, skills and awareness to a specific community work project Breda Friel said: “We define entrepreneurship as the ability to be creative and innovative, whether one is in a business or social sector. Representatives from a wide range of statutory agencies and community groups and youth organisations attended the ceremony, along with academics from the School of Sociology and Applied Social Studies in the Faculty of Social Sciences. Among the organisations represented were Derry Traveller Support Group, Extern, Great Victoria Street Presbyterian Church, Headliners, Donegal Youth Service and Western Education and Library Board.